Nazarov A. Composite High Speed Craft: Practical Design Approaches// SNAME Transactions, Vol.122, 2014. Nazarov A., Jabtanom A., Phormtan T., Suebyiw P. Design Study of 100’ Fuel Efficient Motor Yacht// Design & Construction of Super & Mega Yachts, 13-14 May 2015, Genoa, Italy. Saenbunwang S., Sawatpanich S., Potgieter W., Nazarov A. Small Passenger Craft for South East Asia: Design Specifics and Case Studies// China International Boat Show & High Performance Marine Vessels Conference (HPMV 2015). Nazarov A. Suebyiw P., Piamalung A. Experimental assessment of Impact Loads on Catamaran Structures// Design & Operation of Wind Farm Support Vessels, 28-29 January 2015, London, UK - p.75-84. Jabtanom A., Phormtan T., Nazarov A. Design Development and Construction of 65' Catamaran Yacht// Marine Design Conference, 3-4 September 2014, Coventry, UK, p.127-136. Jabtanom A., Phormtan T., Nazarov A. Design Development and Construction of 65’ Catamaran Yacht// International Journal of Marine Design - The Transactions of Royal Institution of Naval Architects - Vol.156 - Part C1, Jan-Dec 2014, p.163-170. Nazarov A. 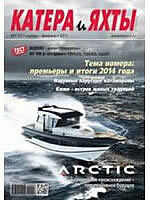 New Developments in Small Catamaran Design// Design & Operation of Wind Farm Support Vessels, 29-30 January 2014, London, UK - p.71-82. Nazarov A., Jabtanom A., Charatsidis N. Small Passenger Boats and Water Taxis: Aesthetic and Functional Aspects of Design //Marine Design Conference, RINA, 2014 - Coventry, UK. p.83-94. Suebyiw P., Leeprasert A., Piamalung. Seatrials: Verification of Boat’s Performance// Boat & Yacht Thailand Conference, 4 April 2014, Pattaya, Thailand. Nazarov A. Composite High Speed Craft: Practical Design Approaches// 4nd Chesapeake Power Boat Symposium - Annapolis, USA, 2014. Nazarov A. Thai Tourist Boat Safety and Lessons Studied// Boat & Yacht Thailand Conference, 4 April 2014, Pattaya, Thailand. Suebyiw P., Piamalung A., Surasorn M., Wongkitrungrueng W., Nazarov A. Application of Radio-Controlled Model Testing for Design of High Speed Craft China International Boat Show & High Performance Marine Vessels Conference (HPMV 2013) - E01-1-9. Nazarov A., Suebyiw P., Leeprasert A., Piamalung A., Surasorn M. Small Patrol Boats: Design for Self-Righting International Journal of Small Craft Technology, 2013 - RINA, London, UK - p. 1-9. Nazarov A., Jabtanom P., Phormtan P., Leeprasert A., Suebyiw P. Catamarans as Superyachts Design and Construction of Super & Mega Yachts, Genoa, Italy - 8-9 May 2013.- P.183-192. Nazarov A., Jabtanom P., Leeprasert A., Suebyiw P., Phormtan P. Expanding the Abilities: Design Development of Wheelchair Friendly Catamaran The Transactions of The Royal Institution of Naval Architects, International Journal of Marine Design Vol. 154 Part C1 2013. Kamath P., Nazarov A. Design and Construction of SM16 Fast Interceptor Craft: Case Study WARSHIP 2013: Minor Warships - 12-13 June 2013, Bath, UK - p.131-139. Nazarov A., Leeprasert A., Piamalung A., Suebyiw P., Wongkitrungrueng W. Design Development for 16.7m Rescue/Patrol Boat Surveliance, Search and Rescue Craft Conference, SURV-8, RINA, 2013 - Poole, UK - p.55-62. Voloshenko S., Nazarov A. Perspectives of Application of Composite Materials for Construction of Small and High Speed Special Craft Navy and Shipbuilding Nowdays - 7th International Conference (NSN’2013), St.Petersburg, Russia, July 4-5, 2013 - p.260-269. Nazarov A. 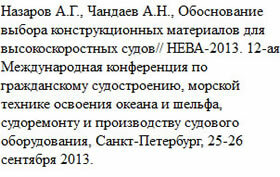 On Design of Small Special Service Craft Navy and Shipbuilding Nowdays - 7th International Conference (NSN’2013), St.Petersburg, Russia, July 4-5, 2013 - p.208-217. Nazarov A. On Application of Parametric Method for Design of Planing Craft 3rd Chesapeake Power Boat Symposium, USA - June 2012. Nazarov A. Power catamarans: design for performance. 2nd Chesapeake Power Boat Symposium, Annapolis, MD - March 2010. Nazarov A. Application of Catamaran Concept for Small Commercial, Special and Pleasure Craft High Performance Marine Vessels Conference (HPMV2011) Shanghai, China 2011 Nazarov A. The Analysis of the Southeast Asia boatbuilding market based on boat construction and design Boat Tech Asia 2007, 23-24 April, Singapore, 2007. Nazarov A. Experimental reserch of sailing craft added masses for hull-keel combinations by accelreation tank tests. The Second High Performance Yacht Design (HPYD 2006) Auckland Conference. 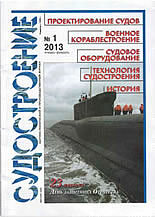 2006 - P.53-57 Nazarov A. Ship Controllability Criteria and Their Application for Small Vessels OSV-2005 Conference, Singapore, 2005.